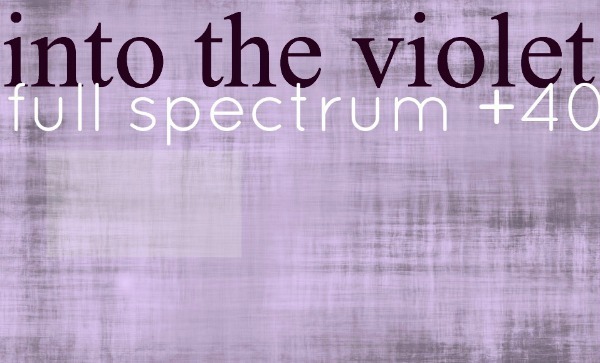 Full Spectrum +40: Our new +40 website, INTO THE VIOLET has launched! 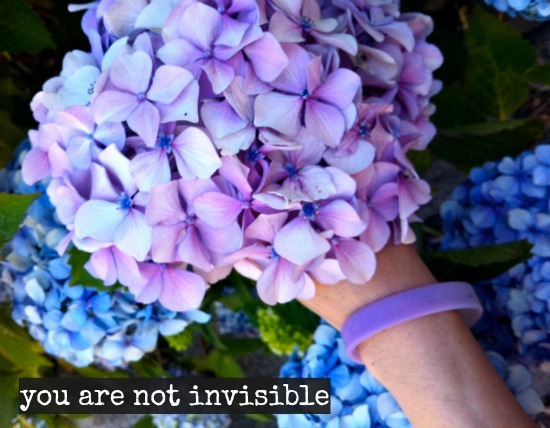 YOU ARE NOT INVISIBLE. YOU ARE BEAUTIFUL. I wrote these words when I created the first stand alone page for the +40 Blog Roll almost 4 years ago. You see, the blog roll had taken a life of its own, and had already outgrown my sidebar, and the post that I had written about it- so I gave it its own page. From the original handful of +40 fashion blogs, the roll is nearing 400, and I feel the need to give it a space where I can fully focus on the community that has sprung up from it- not just for women over 40, but for all women- who need to SEE that +40 is beautiful. Although it's still in beta and very much a work in progress, I'd love for you to check it out, and please share it with your friends. To celebrate the launch of the new +40 website, and to help raise funds for this project, I've created custom silicone ultraviolet bands, made courtesy of wristbands.net with the message that started it all: you are not invisible. you are beautiful. I've been wearing my custom UV wristband non-stop, and I love how I am reminded every time the band turns a deep violet purple, that just because I am over the age of forty, doesn't mean that I can't still have a positive cultural impact, and be joyfully present. 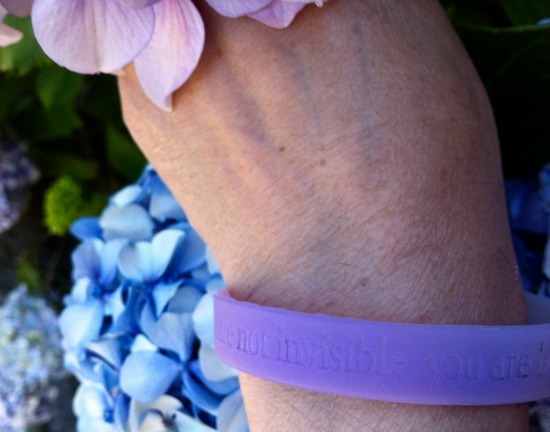 Visible Violets: Buy your Into the Violet Ultraviolet wristband to show your support! You can show your support with the purchase of these bands- and help me maintain the new website and +40 community. More support means more original and community building content in the coming year for us "Ultra Violets." SAYING THANK YOU. I'd like to take a moment to specially thank the following people who have shown me tremendous support, and without which, I never would have the nerve to take on this undertaking. This goes to show how incredible our +40 community is, and how lucky I am to have attracted so many amazing people into my sphere! Vacationistas: The go-to girls for planning GREAT vacations. L'Affaire Cashmere: Specialising in super soft artisanal made cashmere, wool and silk scarves. From now until September 8th, use coupon code dn016 for 15% off your L'Affaire Cashmere scarf purchase. Tooth Soap: Wholesome, natural tooth products made from natural and organic ingredients. Featuring the new and natural way to brighten your smile, Tooth Brights. Use coupon code VIOLET30 for 30% off any Tooth Soap purchase. It's probably no surprise that the above companies are owned/run by +40 women who know the value of community. If you get a chance, please support these fine companies, and check out their services. If you would like to be added to the blog roll, or know someone who should be on it, please use the contact form over at the new website: IntotheViolet.com. Look for upcoming interviews and features of the best on the Blog Roll, and if you'd like to contribute a post, or help build the community, please message me and we can set that up! Linking to the Visible and Beautiful Patti over at Not Dead Yet Style for Visible Monday. Thrilled to be a part of your new adventure! This is fantastic, dear! Every woman, no matter her age, is beautiful and deserves spotlight! Very cool and very relevant...brilliant! Excellent, Bella. I love what you're doing! Seeing so many awesome women is incredibly uplifting. I went onto make the donation but I wanted to do it with PayPal...is that possible? Would love a bracelet for myself and my girlfriend. Great idea, Bella. I can't wait to see more! I applaud you Bella! I've been over to your new website and love what I see. And goodness, there I am on the front page! I'm honoured, dear Bella - thank you! "Into the Violet" reminds me so much of that Jenny Joseph poem, "Warning" - I first read it when I was about 19 and adored it. I have been heading into the violet every since, methinks. Keep us updated on this exciting venture! This is gonna be AWESOME!! There is more style here than the September issue of Vogue could EVER have!! Oh yes--Bella could you change my link in 40+ blogroll to the new address? Thanks!! The website looks amazing Bella!! Thanks so much for including me in my rock 'n roll persona in the photos. This is such a great idea, and you are just the gal to do it. HOw awesome to see all of us 40+ delicious dames in one place!! Nice idea. I've never really felt invisible, even at 53, but I guess that's just my personality. so glad to be part of this wonderful group of women! xoxo Bella for doing this! How amazing you are to think of such a great way to support the 40+ community! Fun page, cannot wait until you have expanded on it. My dear Bella... your building this community... sends such a strong and positive ripple out into not only our community... but the world at large. You are amazing!! Late but nonetheless heart-felt ... Congrats again! Know that the world would be a much drearier place without your efforts, Bella. Thank you for all that you do to support the +40 blogging community! I am happy to be a part of any project that you pursue with your passion. I am thrilled with the new +40 website and the "Ultra Violet" concept. Brava! This is looking great Bella. Thanks so much for your efforts. You are one inspiring lady with kicking style! You rock Bella! What a wonderful project, thank you for spearheading this community and showing the world that life, style, and sense of self is amazing at all ages!